I love a good chicken sandwich and am always on the lookout for a good one. When I saw Todd Wilbur's Ruby Tuesday clone in Top Secret Restaurant Recipes, I knew I had to try it. I joked with my husband that it's the American cordon bleu. 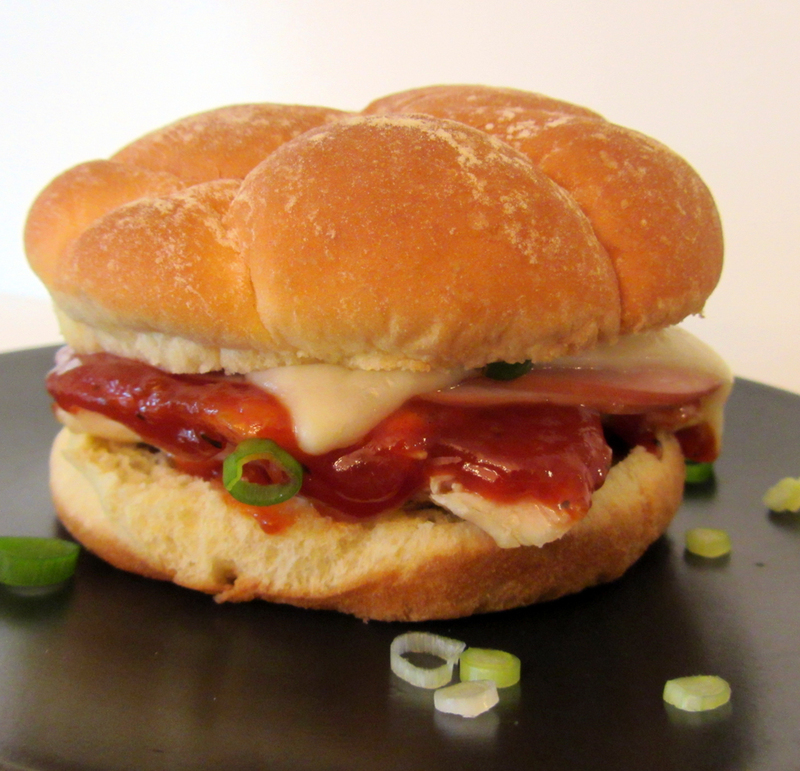 It is grilled chicken with smoked ham, provolone, and BBQ sauce. A great combo! I made the sandwich almost exactly as directed. The only changes were: I used skinless chicken. I omitted the tomato. I used my own sauce (he recommends Bullseye, which would save some prep time). And, finally, I melted the cheese under the broiler to avoid over or under cooking the chicken. This is one tasty sandwich! I've never tried Ruby Tuesday's version, but if it's anything like this, it's a winner! 1. For the Sauce: stir the ketchup and brown sugar together in a small saucepan until smooth. Stir in the remaining ingredients. 2. Put the pan over medium-high heat. Bring to boil. Reduce the heat and simmer for 10 minutes or until the mixture begins to thicken (sauce will become thicker as it cools). 3. Transfer the sauce to a bowl and allow it to come to room temperature. Cover and chill for at least one hour (sauce can be used while it is still hot for this recipe, but tastes even better if you give the flavors the time to blend). 4. Preheat the grill to high. Clean and oil the grate. 5. Pound the chicken breasts to an even thickness (for even cooking). Spray or brush both sides with oil. Season both sides with salt and thyme (crumbled between your fingers). 6. Preheat the broiler. Warm the sauce in a small saucepan or in the microwave. 7. Grill the chicken, flipping half-way, until cooked through. Transfer the chicken to a baking sheet. Spread the sauce evenly over the tops of each piece of chicken. Top each with two slices of the ham and then one slice of the cheese. 8. Place the baking sheet under the hot broiler until the cheese has melted. 9. Place each piece of chicken on a bun bottom. Sprinkle each evenly with the sliced green onion. Add the bun tops. Serve!